A reader sent me a photo yesterday along the lines of those below. I was inspired to create a few of my own. I hope you like them. If you do, feel free to share them. It’s funny, I never thought I was a cat person. Until my little kitten came along. And I learned to meow. 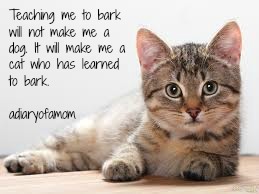 Teaching me to bark will not make me a dog. It will make me a cat who has learned to bark. i am not a defective dog. i am a beautiful cat. That is adorable and profound at the same time. Very cute. I am a true cat person. I have 4 of them. At one time I had 9 (don’t judge)…when I lived in Philly for 2 years, the stray cat problem was so bad, and I just couldn’t turn away a hungry little face. I also would get them fixed, btw, so they wouldn’t make more homeless kitties. Love the sentiment here, and so so true. Makes me think of the book “All Cats Have Asperger Syndrome” is a picture book that help explain the ways Aspie kids can be different. 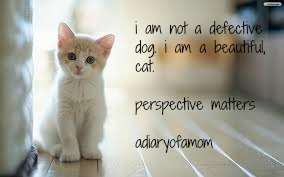 (Though some of the statements are generalizations–I found it very helpful to understand my brother, and my mom has used with elementary school kids). 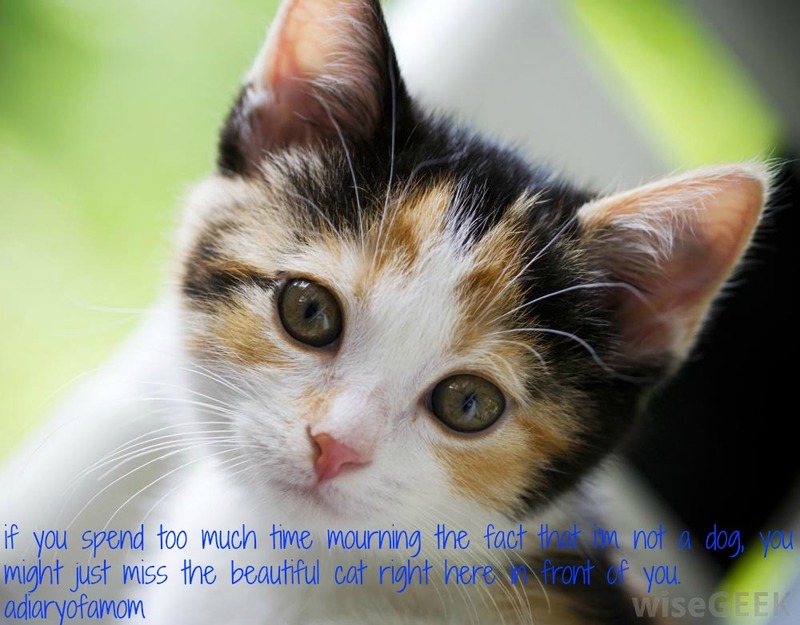 I do love my beautiful cat, so very much. I just worry that the dogs will eat him. On another note, because I know you get it, my Kylie was showing me her gym exercises last night. She can finally do an actual, real, coordinated jumping jack!! That was such a motor planning struggle for so long. Just my little excited and proud moment because no one else “gets it” like you! Congrats on the jumping jack! I remember the first time my kiddo actually jumped, with both feet off the floor, for the first time SO vividly. Years after his peers. These milestones, which most people take for granted, are so hard earned. Enjoy! Oh.. How I needed this today. THANK YOU. I couldn’t agree more! I would never try to turn my cat into a dog, so I shouldn’t work so hard to turn my sons with autism into something they are not. Isn’t it amazing how your baby got your undivided attention because she needed it. It’s all about how we see things isn’t it.